Noticed by Techcrunch earlier today, Facebook is taking a page out of the Google+ playbook by allowing users the ability to edit any old comments on status updates, photos, videos or other content posted on Facebook. While the social network did roll out a feature during April 2011 that allowed allowed users to edit comments within a few seconds of posting a reply, that restriction has been lifted and users can edit comments without any regard to a specific time limit. This will be particularly helpful for anyone that makes a spelling mistake, but doesn’t realize the error until an hour later. It also allows people to alter a comment on controversial topics if deemed offensive by their friends. 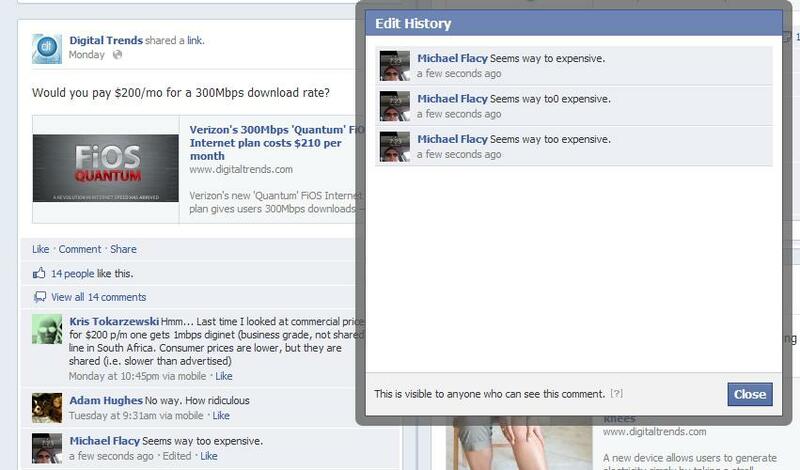 In addition, Facebook includes a new “Edited” link between the time of the post and the “Like” link on the comment. When clicking the “Edited” link, a pop-up window will appear that lists all changes to the comment. Similar to changes made on Wikipedia, a Facebook user can browse through the edit history in order to understand what was changed. In addition, the time on the comment is changed to correspond with the most recent edit. However, the friend that originally received a notification about the comment will not receive another notification about the edit. For instance, if a Facebook user edits a comment made six months ago, it’s highly unlikely that anyone will notice. According to Mashable, a Facebook representative noted that this updated feature has gone live for a portion of users today and will continue to launch across all user profiles over the next couple days. Facebook management hasn’t made any indication that this feature will roll out to the Facebook commenting platform for third party sites or the mobile interface in the near future. Anyone typing on a smartphone would probably love to take advantage of this new feature as it can be easy to type incorrect letters on a virtual keyboard. To edit a Facebook comment, simply click the pencil icon on the right side of the comment box and type the correction. Facebook also hasn’t mentioned if the same feature will be launched on the original post. Opposite of Google+, Facebook does not allow the user to edit a status update to fix a spelling mistake or change the context of the post. At the moment, users can only delete the post, alter the post time to appear in a different location in the Timeline or add a location to the post. While this may lead to users changing the topic completely and making the comments left on the post look silly, adding an “Edited” link with the post history would help avoid confusion. Also rolled out this week, Facebook added a collection of emoticons to the chat interface. Available in the bottom right corner of the chat window, Facebook users can choose from twenty-one different icons such as smiley faces or the familiar Facebook thumbs up. The emoticons will only appear in graphical form on the Web version of the site. If a Facebook user sends an emoticon to a friend that’s using a mobile device, they will see the text version of the emoticon.